Some of you have already reported to me that this year, Holy Week and Easter at St Martin’s had special quality. No doubt this has much to do with Fr Bill+, whose reputation for liturgical sensitivity is well earned. I also want to say how appreciative I am Bill+, for your generous invitation to me to be the preacher today. Today is known as Low Sunday. It seems no one really knows anymore why the Sunday after Easter bears this enigmatic descriptor. At least Low Sunday is marginally better than Quasimodogeniti, which was the name for this Sunday in the old Latin Rite, deriving from the opening words of the introit As newborn babes, desire the rational milk without guile. There is a suggestion that the name derives from an early custom of the newly baptized, having worn their baptismal albs all week, today enjoying a much-needed change of clothes. This Sunday is also known as Doubting Thomas Sunday. In churches up and down the land preachers will be addressing the imagined polarization of doubt and faith. Thomas, depending on your theology emerges as a personification of the evils or the virtues of doubting. Episcopalians tend towards Thomas as a kind of everyman, a personification of the virtue of doubt. For us the seeds of faith are sown in the fields of doubt. Psychologically, I have always felt that the name Low reflects a very necessary ebbing of energy following the energetic highs of Holy Week and Easter. The Sunday after Easter has always been for me a time for some well-earned and very needed recuperation. Except that this year, Low Sunday is the occasion for meeting a new congregation – not a time for me to luxuriate in lethargy. Part I When it was evening on that day, the first day of the week, and the doors of the house where the disciples had met were locked for fear of the [Temple authorities and their henchmen]… . So this is how it begins. The disciples of Jesus – dis-spirited – hiding themselves away – utterly exhausted and confounded by the events of the last week – exhausted beyond imagining – but the worst kind of exhaustion – the kind that also is accompanied by an agitated state of heightened anxiety. So this is how it all begins. Yet, it wasn’t meant to be this way! Until Thursday night when it became clear to them that events were taking an unexpected turn for the worst – until then they had felt on the crest of something so huge. For months they had had this sense of growing momentum, of expectation that the world as they knew it was about to dramatically change. After all, were they not the Messiah’s inner circle? For months now, Jesus had been showing them that he meant business. Ever since they had left Galilee it had been one amazing event after another. There was even that strange event with the woman at the well, in Samaria of all places. Then there was the amazing confrontation with the Pharisees over Jesus’ healing of the man blind from birth, which had both frightened them, and yet convinced them that Jesus, was unstoppable. Then only a week ago had Jesus not demonstrated his messiah-ship beyond doubt by raising Lazarus from the dead? Jesus was definitely the one who was about to spear-head a volte face, a turn-about-face, not only in their personal fortunes, but the fortunes of the whole Jewish nation. Jesus the Messiah – the promised-one – about which the prophets had spoken – the one who had finally come to set things right. How had it come to this? If only Jesus had somehow not overplayed his hand with the Temple Priests. If only he had taken the way out that the governor had been trying to offer him. If only he had not confronted the authorities, a confrontation that had so terrified them and scattered in all directions. Even Peter, whom they all looked up to, their rock, had denied the Lord in the end, just as Jesus had said he would. But what were they to do? Jesus had pushed it too far! He had miscalculated and this had cost them all dearly. First the death – that shameful death that now stigmatized all of them -the stigma of their leader’s death by crucifixion – as if Jesus was a criminal. Oh the shame of it all – shame as well as- as well as the loss, the grief, and of course their own guilt. The resurrection was a complex experience for the disciples. It’s easy to relate to their experience of bewildering loss and disillusionment. We can even relate to their fear of being persecuted by the forces that put Jesus to death. I think it’s harder though, for us to recognize the effects of shame and guilt in play within them at the end of Easter Day. There is the guilt of having failed Jesus, denying and deserting him at his eleventh hour. Yet, I imagine it’s the shame that is most crippling. The disciples were ashamed of the way Jesus had died. 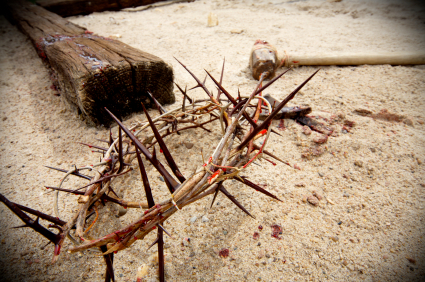 How could the Messiah have been put to death on a cross? Even more problematic, how could someone who died such a publically, shameful death, be resurrected? The disciples had seen Jesus die. They had witnessed his burial and now the worrying mystery of the tomb being empty simply adds to their sense of terror and confusion. It’s true that Mary Magdalene had reported her enigmatic experience of the risen Christ earlier in the day. Yet how can the men credit with any authority the witness of a mere woman? The disciples behave as human beings behave in the face of overwhelming, and conflicting emotion. Secluded behind doors of wood and walls of plaster they seek that feeling of safety amidst a hostile, external world. Yet, the doors of wood and walls of plaster are emblematic of the impenetrable walls and doors within their minds. These, they have erected to shield themselves from the tsunami of conflicting emotion. Within them feelings of grief, fear, disillusionment, guilt, and shame vie for self-accusatory, ascendancy. Part II Jesus came and stood among them and said, ‘Peace be with you.’ He showed them his hands and his side. Then the disciples rejoiced when they saw the Lord. Locked away within the turmoil of conflicting emotions the disciples are not mentally ready to recognize Jesus. The old adage – the mind recognizes only what it is already looking for – applies here. They don’t expect to encounter Jesus because for them, he is dead. They don’t recognize him when he appears in their midst until he evokes a connection between his present transformed appearance and the wounds of his crucifixion. All the post resurrection appearances in both Luke and John operate on this pattern, either Jesus shows them his wounds or he breaks bread with them, only then do the disciples know him. What we call memory results when chains of associations become linked together, build-up from the isolated impressions stored away in our minds. These linkages in the chain of associations that build memories become broken as a result of overwhelming emotion such as grief or shame, which can only be processed with time. What we can see in the post-resurrection appearances is Jesus repairing the associational links in the disciple’s memories, broken by the trauma they experienced on Good Friday. Through action – i.e. breaking bread, or showing his wounds, Jesus reconnects the broken links of associational impressions in the disciples minds. The result – they recognize him as he now appears – seemingly miraculously before them – connecting the post resurrection Jesus with the Jesus they remember. Then they rejoice! Can you feel their sense of, ‘phew! Jesus isn’t rejecting us for our failures as disciples and friends, after-all.’ It is so crucial that we note here that Jesus does not seek out new and better disciples. He returns to those who have failed him. He breathes new life into them and sends them out to forgive sins. We are so familiar with Luke’s version of the descent of the Holy Spirit on Day of Pentecost that we tend to skate-over John’s less dramatic version of this event. Here in the locked room, Jesus forgives the disciples for their human limitations. He then, breathes the gift of the Holy Spirit into them empowering them to now go-out into the world to forgive sins. Christians often, terribly misunderstand this passage. Jesus is not sending the disciples out to judge others. He is not commissioning them, as the Church has so often seen itself, as the arbiters between right and wrong. Jesus is not sending them out to judge the world. He is sending them out to extend their experience of having been forgiven by inviting others into the experience of forgiveness. Accepting forgiveness can be a complex process. Perhaps Jesus has this in mind when he tells the disciples that some sins will be retained. Human beings and human communities have a tendency to resist forgiveness. We cling to past hurts and grievances, refusing to forgive or be forgiven. Such retention of past sin harms us and harms our communities, impeding the creation of more creative associational links , i.e. more hopeful memories that are able to support new and better choices. What we hear in this text is God’s invitation to know ourselves to be truly forgiven. When we so come to know ourselves, then how can we not invite others into that same experience, especially because as miserable failures, we human beings are only too aware of the harm that results when sin is retained. John’s account of Jesus’ appearing to the disciples at the end of the first Easter Day helps us to frame a question about the future. I would like to suggest the over-riding question for us is and will continue to be: what kind of community are we dreaming of becoming? As your rector-elect, I seek only to frame the question. Together, we as the community of St Martin’s will begin to answer that question as we journey into the future. However, what I feel I can do is to remind us of who we are. We are the heirs to the historic tradition of catholic and apostolic Christianity, physically situated on Orchard Avenue, in Wayland Park, in Providence, RI. More particularly, our historic catholic inheritance comes to us through the distinctive channel of over a thousand years of Anglican Tradition. This is a tradition of Christianity that understands that the function of being the Church is to exist for those who are not yet its members, and for those who may never come to see themselves as members of the Church. Our task is to witness to the presence of God, active in the world around us. We are to be what the Celts knew of as a thin place through which, the expectations of Kingdom of God permeate into the world around. Like many Christian communities today facing the fearful uncertainties of a future yet to become known to us, we experience the temptation to retreat into a fearful self- preoccupation, like the disciples at the end of the first Easter Day. We are the Church. Our purpose is to attest to God’s work in the world. Each of us must be an extension of our community, reaching-out to others with whom we live and work and enjoy social connections in order to invite them into the community of the forgiven. In his blog Listening Hermit, Peter Woods describing himself as a helpless digger into etymological meanings draws our attention to John’s use of the Greek word kleiso meaning closed, as in the doors were locked. He describes rolling the word around in his mouth as he tries to work out what the word associates-to, in his mind. Finally, it comes to him. Klesio is related to another more familiar Greek word, ecclesia. Where Klesio means closed, ecclesia means not closed. It is important to note that ecclesia comes to be the word the first Christians adopted to refer to themselves as a community. The first Christians had come to see themselves as an open society, a society with open doors. This development, so soon after the death of Jesus sharply contrasts with John’s description of the disciples on the Day of Resurrection and following weeks. Jesus, at the end of Easter Day finds his disciples not only cowering behind closed doors, but locked away within closed minds. At St Martin’s we are the Church – the Ecclesia – a community with open doors – a community of the forgiven extending God’s invitation of forgiveness into the world part of which involves the healing of our broken memories. This is the message of the resurrection. Let this Easter message give shape and content to our over-riding question: what kind of community are we dreaming of becoming? In some ways it’s less important to know the answer and more important to keep asking the question. Because its only when we ask such a question that we begin to participate with God in God’s dreaming us into becoming. Since the second Sunday of Lent we have been journeying with Jesus through the eyes of John the Evangelist, the writer of the Fourth Gospel. John does not follow the same gospel structure, first developed by the Evangelist Mark, and followed with some additions and variations of emphasis, by both Matthew, and Luke. Instead, John paints a purely theological picture of Jesus. John’s theological picture of Jesus, his identity, and his mission, jumps out at us as he builds his Gospel around seven stories, offered as stories concerning the Signs of the Kingdom. As the Father has loved me, and I love the Father; so I, and the Father through me, love you; therefore you must love one another. As the Father and I are one, and you and I are one, so the Father and you are one. For John, love is the principal sign of the presence of the Kingdom among us. At https://www.facebook.com/azcathedral?ref=hl and here at my blogsite at you can review my treatment of the last three Sundays Gospel readings: the woman at the well, the healing of the one blind since birth, and today, the raising of Lazarus. In each I have employed the metaphor of the play, divided in two several acts or scenes in order to unpack and explore the complexity within each Sign of the Kingdom story. Any metaphor, however fruitful, is vulnerable to over use. So I want to approach today’s gospel from a different tack. Psychosynthesis, is a psychological and philosophical school belonging within the tradition called Transpersonal Psychology. In Transpersonal Psychology the ultimate goal of psychological development is the spiritual integration of the psyche and the soul within a three-fold unity of body, mind, and spirit. Roberto Assagioli, the founder of Psychosynthesis was an early disciple of the great Sigmund Freud. However he parted company with Freud over Freud’s discounting of the spiritual component in human development. In viewing psycho-emotional and spiritual development proceeding in tandem, Assagioli coined the term bi-focal vision. My psychosynthetic training proves invaluable in my ministry as a priest. In my pastoral relationships I employ Assagioli’s concept of bi-focal vision to keep my eye on both the emotional and spiritual aspects within another person’s reporting of their experience. It occurs to me that the concept of bi-focal vision offers us another way of exploring the complexity in John’s Signs of the Kingdom stories. Bi-focal vision tracks two distinct elements that are nevertheless interconnected and intertwined. Applied to John’s Gospel, the use of bi-focal vision allows us to identify distinct, yet interwoven transpersonal and personal themes, out of which John weaves his theology of Jesus. In the story of the raising of Lazarus the synopsis is: Jesus, with his disciples received a message from the sisters of Lazarus that their brother is ill and dying. Jesus greets the news with what appears to be detached disregard, saying Lazarus is not going to die, rather that what is happening to him is an opportunity to glorify God. He then delays setting off for Lazarus, Martha, and Mary’s home in Bethany by two whole days. In the meantime Lazarus does die and is interred in his tomb. After two days Jesus nonchalantly declares that now Lazarus has died it’s time to visit his friends in Bethany, which is not far form Jerusalem. This fills his disciples with dismay for Judea is now a very dangerous place for Jesus to go. Last time he was there he narrowly escaped being stoned to death. Nevertheless they all set off and as Jesus nears Bethany, first Martha, having heard of his approach rushes out to greet him. Likewise a little later Mary, when she hears of Jesus’ approach also goes out to greet him. Despite his seemingly contradictory delay in coming, Jesus, now in state of some emotional distress, eventually arrives at the tomb and calls Lazarus to awaken and come out, which he does. When we apply bi-focal vision to this story, we can begin to more distinctly view both the transpersonal, i.e. the dimension beyond the personal, and the personal, i.e. human relationship dimension. Both dimensions are integral elements in the stories and by which John articulates his theology of Jesus. I want to take and contrast the two encounters Jesus has, first with Martha, and then her sister, Mary. Incidentally, we know both these women independently of John’s account. Both Martha and Mary appear in Luke 10:38-42, from which we learn that Martha is the active, doer, always on-the-go, while Mary is the contemplative one. While John does not mention any of that it’s interesting that Martha is the first to go out and meet Jesus, while Mary takes some time to learn of Jesus’ approach. I find it fascinating to note that both sisters greet Jesus with identical words: Lord, if you had been here my brother Lazarus would not have died. It is interesting to observe how Jesus’ encounter with each sister could not be more different. In his response to Martha we see Jesus in transpersonal focus. His response to Martha’s words of mild rebuke, is to evoke from her a profession of faith in the resurrection. He then identifies the resurrection with himself, leading Martha to proclaim: Yes Lord, I believe that you are the Messiah, the Son of God, the one who is coming into the world. Here is John’s transpersonal theology being proclaimed. In the transpersonal space, Jesus understands the death of Lazarus as an opportunity not for sorrow, but one through which God will reveal his true identity in order to provoke an individual recognition and consequent leap of faith. In this space there is no need to hurry because the result is already ordained. In his encounter with Martha there is no hint of the human emotions inherent to this very stressful situation. The human dimension, with its intense emotionality of relationship remains invisible to our gaze. Through the bi-focal lens we view the event only at the level of its transpersonal significance. By contrast, Jesus response to Mary using the same words as her sister, reveals to us his identification at the human level with the love and grief he feels for this family. In response to Mary’s weeping, Jesus is overcome by the disturbances of human emotion. John reports Jesus as being greatly disturbed in spirit and deeply moved. The result is that Jesus too, begins to weep with Mary. He then goes weeping to her brother’s tomb. Through the bi-focal lens our gaze now falls upon the human dimension of empathic feeling flowing from ties of love and affection. Nowhere else, does Jesus appear more vulnerable and human, than in his response to Mary and his experience at the tomb of his dead friend. At the tomb we see the coming together of the intertwined nature of the transpersonal and personal dimensions in John’s story. While still weeping, Jesus now invokes his special transpersonal connection with God: so that they [the onlookers] may believe that you sent me! For John, the raising of Lazarus is the turning point at which there is no return from the path of the cross. We learn if we could read-on in our text that some of the onlookers reject the transpersonal message of salvation and go off to conspire with the Temple authorities, who now vow to put Jesus to death as apolitical expediency for the sake of the whole nation. The Fifth Sunday in Lent is traditionally known as Passion Sunday and marks the beginning of Passiontide. From here, the following week leads us to Palm Sunday and the commencement of Holy Week. During Passiontide we get to sing some of the best hymns of the whole Christian Year. The Anglican Tradition in our Episcopal Church bequeaths to us that great liturgical tradition of ancient, catholic and apostolic Christianity. We are liturgical Christians and at no other time of the Christian year is this fact more important than over the next 14 days. For liturgy is a vehicle and the purpose of a vehicle is to transport us from one place to another. Liturgy too, has to be viewed through a bi-focal lens. Viewed in this way we see liturgy as a vehicle transporting us from one location in physical time and space to another, i.e. Passion Sunday to Easter Day and beyond. We also perceive that the liturgy transports us from one psychospiritual space to another, i.e. from pre-resurrection to post-resurrection in transpersonal time. I encourage all to participate by climbing on-board the liturgical vehicle that is about to embark on the final phase of the journey that conveys us to the true joy of resurrection in post-resurrection time. Beginning on Palm Sunday, and continuing over the days of the week that follow, please join us in the multiple opportunities provided by our Holy Week liturgical calendar. By attending the liturgies of Holy Week, and the Triduum – the Great Three Days of Maundy Thursday, Good Friday, the Easter Saturday, and Easter Day, we have the opportunity to become active participants (not merely passive bystanders) in the unfolding liturgical drama of the cross and resurrection. When viewed bi-focally, these are events of huge transpersonal significance, yet equally events that move us at the deepest levels of our human emotional need. Spiritual Practice lies at the very heart of what it means to be an Episcopalian. Our Anglican Tradition of spirituality has deep roots in the ancient Benedictine spirituality that came to be one of the chief characteristics of English Christianity. This ancient spirituality was given a reemphasis at the English Reformation, particularly in Thomas Cranmer’s reforms of the liturgy that led to the creation of The Book of Common Prayer. Benedictine, and what later came to be identified as Anglican spirituality, emphasizes the importance of the ordinary rather than the extraordinary. It teaches that God is to most often found in the midst of the ordinary events of the daily round of our individual lives, and our life lived in community. The great figures of Anglican Tradition are not referred to primarily as theologians, or prelates. Historically we have used the word divine to refer to our great thinkers and spiritual practitioners. This communicates another of the Benedictine influences which has resulted in the formative figures of our tradition being valued because of their teaching and practice of the spiritual life of prayer, study, and reflection. The period of the 16th– 17th centuries saw the flowering of classical Anglican Spirituality as exemplified in the lives and writing of a group known as the Caroline Divines http://anglicanhistory.org/caroline/ We continue to look back to this period as the one in which the quintessential expression of Anglican spirituality comes into modern flower. St Benedict referred to his small community as a little school of prayer. The Greek’s used the word askesis to describe a kind of gymnasium for spiritual practice. This gives us our English words ascetical or ascetic to describe the disciplines of the spiritual life. Anglican theology is really ascetic theology as described by Benedict as a little school of prayer. Worship, for Episcopalians is the primary spiritual expression of the Christian life. All other aspects of Christian ministry and service flow from the central root of worship. Worship is where the community of faith and God primarily encounter each other. It is in worship that we transcend personal differences. In each generation it is in worship that we hear God’s invitation to conversation addressing the challenges of Christian living. It is in worship that the human heart soars to meet God in praise and thanksgiving. We use the term liturgy to refer to the practice of worship. It is another Greek word, which in origin means the work or the service performed by the community of the baptized in the world. Liturgy is also the word we use to describe the way the community of the baptized structure the patterns for their service of worship. The Episcopal Church is therefore, a liturgical Church. Liturgy and music emerge out of an inheritance from the past, reformulated for the yet-to-come through the prism of present. The Anglican musical tradition gives expression to a remarkable synthesis of transcendence and intimacy able to address the hunger at the heart of modern imagination. We need more, rather than less, of this food. Present day challenges catalyze musical and liturgical innovation enabling our tradition to speak in an age characterized by plurality of spiritual need, rich individual and communal diversity, and rapid, destabilizing change. Psychospiritually, liturgical worship is best likened to a process of oscillation between our here-and-now awareness and the deep unconscious currents of God’s communication with us as the faithful community. Through worship we approach a thin place where the dimension of time and space intersects with the dimension of divine energy. We enter worship as individuals. In worship we become formed into a corporate body – the Body of Christ. Here, we are nourished and refreshed by the energies of encounter with the divine. This is a journey that we undertake every time we celebrate worship, esp. Eucharistic worship. The formality of Anglican liturgy invites transcendent connection, which paradoxically floods individual experience with a longed-for warmth of intimacy with God and with one another. Liturgy addresses the human psychological need for spiritual transformation. Movement and music are liturgy’s tools. The Episcopal Church is the location where liturgy and music become effective instruments for transformation in the lives of individuals identifying with multiple and overlapping communities of interest. In the 21st Century, church has little concrete meaning for many people who nevertheless are discovering the Anglican Tradition of the Episcopal Church as a location for encounter with a sense of the numinous. Each week, I meet at least four or five such persons who pass through the Great Doors of Trinity Cathedral. They seem propelled by an inarticulate sense of spiritual loneliness and longing. At Trinity, they encounter the power of our liturgy, which beckons them to return. Eventually, many report three identifiable components in this encounter: traditional Anglican liturgy, preaching that seeks to address the bewildering confusions at the heart of their spiritual loneliness within complex contemporary life, and the experience of seeing themselves reflected in the diversity of the faces of other people around them. Through liturgy, music, and welcome of diversity, our churches become the location for a unique quality of spiritual encounter for people with little connection to religion but for whom spirituality is a search for meaning. Our Anglican Tradition of worship, structured by The Book of Common Prayer, places the Episcopal Church at the intersection of contemporary social, civic, and spiritual life, as never before. Here, the spiritually seeking, the spiritually illiterate, and the conventionally religious find a location for spiritual and social encounter capable of addressing the plurality of today’s needs and the opportunities, and hopes, of tomorrow’s world. This is both a form of worship as well as comprising the second element of Anglican spiritual practice. The reference to common simply means prayer of the people of God in distinction to individual prayer. The ancient patterns of the Daily or Divine Office comprised of seven services of prayer throughout the day and night. The rhythm of this cycle of prayer not only expressed a need to praise God, but also regulated the daily round of life. This seven-fold pattern is condensed in the Book of Common Prayer of 1979 into four orders for Morning, Midday, Evening and Night Prayer. It was Cranmer’s original intention – see back to the session on The Book of Common Prayer https://relationalrealities.com/2014/03/26/christian-essentials-101-true-worship/ that these become services of public worship, in addition to forming a daily pattern for personal devotional practice. When we participate in these patterns of common prayer, either by reading them from the prayer book, or prayer book app https://itunes.apple.com/us/app/book-common-prayer-daily-office/id574757244?mt=8 or listening to them http://www.missionstclare.com/english/ , or attending them in a church, we are plugging-into the perpetual cycle of the Church’s common prayer, rather like a plug is inserted into the electrical current. While the current flows all the time, we only light-up when plugged-in. Anglican Tradition, because of its Benedictine nature, places great emphasis on the importance of participating in common prayer or the Daily Office. This practice remains a formal obligation of the clergy of the Church of England and a strong spiritual practice for the clergy of the Episcopal Church. As you can see from the links above, we now have wonderful electronic access points so that all of us can participate in the patterns of common prayer in ways the fit well with our busy modern lives. Open the Bible randomly and let your eyes full on a section of verses, maybe no more than 3 or 4 in number e.g. Mark 4:26-28. For those of us new to this practice I suggest use the psalms or the Gospels for this. Then read the passage slowly three times. What is the word or phrase that stands out for you? Repeat it softly to your self over the period of a minute or so. Then read it twice more and ask yourself how does this word or phrase connect with my experience at the moment, what are my associations to it, what does it remind me of or make me think about? Read it again letting it sound in your mind or out loud and ask yourself – is there an invitation from God in this passage that applies to my life over the next 5 – 7 days? Finish with prayerful reflection on gratitude and thankfulness for what God is revealing to you through this passage. This is a method for praying the Scriptures rather than just studying them. Reflection is the forth element of Anglican spiritual practice. The Caroline Divines used the lovely phrase, habitual recollection to refer to the spiritual practice of reflection. This is the cultivation of an awareness of the presence of God in the world around us. This can be a sudden experience of beauty in a sunrise or sunset, a moment of encounter with another person, or an experience that fills us with gratitude. God is present to our rational faculties of perception in the natural world and in human society. The practice of contemplation is mindfully reflecting on the presence of God. Habitual recollection may also open us to experience the seeming absence of God, during times of disappointment. find somewhere to sit quietly at home or elsewhere so to bring your attention to the rising and falling of our breath. We imagine the breath deep within our belly, rather than in our chest while we simply observe ourselves breathing. Through observing our breath we come easily into the presence of God, who is the breath that is the source of all life. There is never a moment when we are not breathing. Yet, because we do it all the time we hardly ever notice the experience. Once we have stabilized and relaxed into our observation of breathing we can allow a word or mantra to rise and full on the breath. This can be anything, but the one I recommend is the Aramaic word Maranatha. Aramaic was the language commonly used by Jesus. Maranatha simply means: Come, Lord. It is important that the word we use does not stimulate intellectual thought. It is also important that we use a word or a phrase that can be easily divided into syllables that attach to the rising and falling of the breath. In this way the first two syllables ma-ra attach to the in-breath, with na-tha sounding on the out- breath. Habitual recollection or meditation or contemplation, are all methods for developing a mindful awareness of God in each present moment of the day. Spiritual practice is best thought of as a daily routine to orient us to the presence and experience of God in our lives. I have listed the formal components of a balanced approach to spiritual practice. However, there are lots of permutations and combinations and the most important thing is to begin something, and to begin with a structure and pattern that fits the demands of your life. There is nothing to be gained by being overly ambitious. So start small, start slow, but the important thing is to make a start. For busy, people make use of the apps that are now available to smart phone and tablet devices. These afford flexibility and convenience. Spiritual practice is also a way to manage the stresses of our day. Benedict advised his monks to start and then to consciously stop activity and allowing a pause before starting a new activity. Our problem today is that we start, but never really stop anything, reaching the end of the day with an accumulation of unfinished business weighing us down. Stopping does not mean completing, it simply means recognizing a natural boundary when one activity or task, of necessity makes room for what needs to follow in the day. There is always next time! The patterns of common prayer: morning, midday, evening, and night reflect the human body’s biorhythm as well as the changing mood and texture of the day. Each prayer evokes the tone of the time of day. Paying attention to this helps us regulate ourselves emotionally and energetically, as we move through the course of each day. if the hyperlinks don’t connect cut and past to your browser.